I have owned this clock for over 20 years but have never know anything about it. I purchased it from an antique store and it is in the original condition except for some work done on the mechanism and cleaning. There are no markings on the case or the movement. 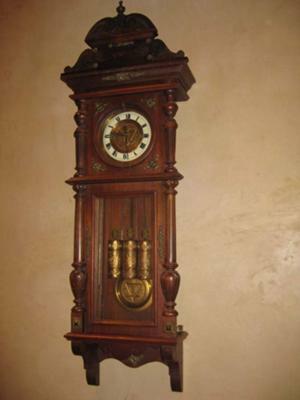 It is commonly called a "blind man's" clock as it has three weights and chimes each quarter hour along with the hour. I also have searched the internet for the symbols that are on the dial and pendulum but have been unsuccessful in identifying them. Any help I receive in helping me identify this clock will be greatly appreciated.